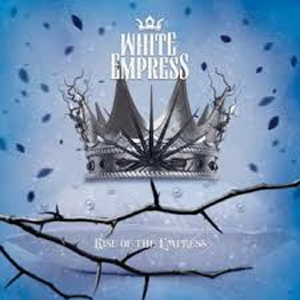 WHITE EMPRESS, the new band founded by former CRADLE OF FILTH guitarist Paul Allender, is streaming their debut album, Rise Of The Empress, a day ahead of it's September 30th release via Peaceville Records in conjunction with PledgeMusic. Check out the album stream right HERE. Rise Of The Empress can be pre-ordered now through the Peaceville web store or digitally through iTunes. Formed by guitarist Paul Allender and with a full band lineup, this new venture into the metal landscape under the moniker ofWHITE EMPRESS exudes the depth and ferocity of his prior work whilst pushing new boundaries. Allender's signature razor-sharp riffing and epic, melodic twists and turns compliment the sumptuously alluring and often demonic voice of Mary Zimmer (LUNA MORTIS) to create a master class in savage, yet uplifting metallic darkness. The album was recorded in WHITE EMPRESS' studio and has been mixed and mastered by veteran producer Kit Woolven (THIN LIZZY, CRADLE OF FILTH). With Allender's relentless guitar and Zimmer's diverse vocals, ranging from operatic to death metal screams, WHITE EMPRESS is exploring new areas of metal. "The Ecstatic And The Sorrow"
"Obsession With The Empress (Human To Divine)"
"Fall Of The Old Guard"
"WHITE EMPRESS is the link the music scene has been so desperately missing," said Allender. "The band started writing together two years ago, and have slowly crafted the sound that is WHITE EMPRESS. WHITE EMPRESS has all the best parts of the metal scene rolled up into one band. The music is hard, but emotive. WHITE EMPRESS' unique style and sound is bringing fresh life to the music scene that it's been crying out for." In between working with CRADLE OF FILTH, Allender relocated to the US in 2012 and decided to start work on another project with local musicians in his newly adopted home of Minneapolis, Minn. along with his friend, Martin Skaroupka from CRADLE OF FILTH. This soon became WHITE EMPRESS. Having also recently released the acclaimed EP, White Empress, the stage was set for a full-on assault. WHITE EMPRESS comprises: Paul Allender, formerly the main guitarist and songwriter in CRADLE OF FILTH, vocalist Mary Zimmer from LUNA MORTIS, Will Graney, keyboardist from DAMNATION ANGELS, Chela Harper, bass player for COAL CHAMBER, guitarist Jeremy Kohnmann from THE AWAKENING and drummer Zac Morris, who's played with many bands including UGLY KID JOE.